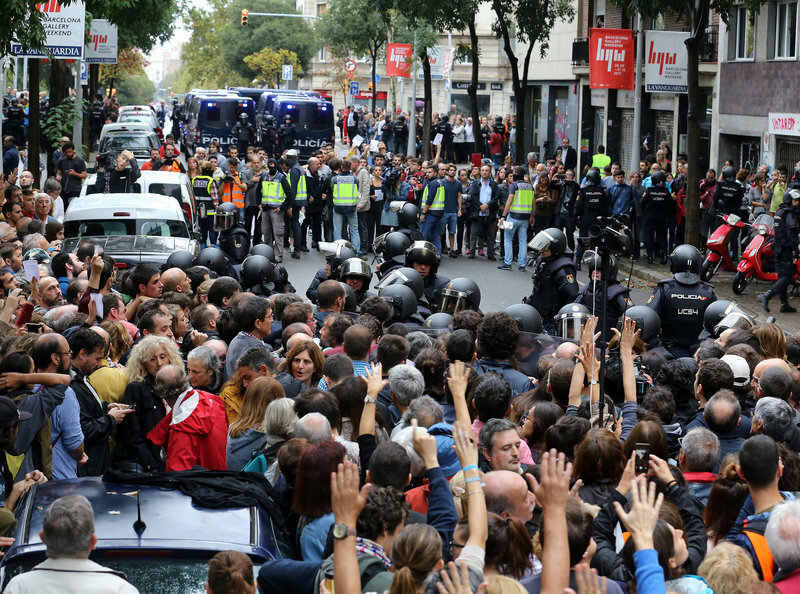 1-O at Ramon Llull school where Spanish riot police charged voters and caused injuries JUANMA RAMOS. In the six weeks of the trial against the Catalan political prisoners, no expert witness from either side has so far testified to any serious violent actions which would be sufficient to hold up a charge of rebellion against the accused. The “human walls” set up to block access to polling stations on 1-O, “the hateful faces”, “teasing” and a death threat (heard for the first time last week) reported by agents of the armed corps are not enough, say jurisprudence experts. So how can the office of the prosecutor maintain the accusation of rebellion? The criminal lawyer and law Joaquim Bages Santacana (University of Barcelona) states that, when drafting the new penal code, and the definition of rebellion, in 1995, the legislature did not define what types of violence would be necessary to be considered a violent attack on fundamental rights. Other experts have already asserted that in the build up to the trial, in the discovery phases, the judge of instruction for the Supreme Court, Pablo Llarena, has already been guilty of a too-broad interpretation of the crime of rebellion. The dangers of interpretation are rising as the trial rolls on, according to Bages, because of a growing “spiritualization or volatilization” of the concept of violence. He develops this thesis in a recent paper, in which he asserts “whilst it is true that violence cannot be defined in a completely objective manner, because it has an important component of subjective social content, it cannot be left defined so vaguely in law, that any act which violates the will of a passive subject, that is to say prevents their action, is deemed violent”. Bages is interviewed in today’s Nacional section.